What is Cerebral folate deficiency (CFD)? CFD occurs when the amount of the active form of folate in the brain is less than the amount that is in the rest of the body. CFD could be from either a broken process of the folate transport system or from increased folate turnover within the central nervous system. (Cerebral folate deficiency. Ramaekers VT, Blau N.) Symptoms from lack of folates in the brain first appear at around four to six months of age. spasticity- stiff or rigid muscles. It may also be called unusual "tightness" or increased muscle tone. CFD caught my attention when I read about the slowing of head growth. I had noticed and worried that Jett's head size was small for his body. For instance, at 2.6 years/30 months old, Jett's body size was that of a typical 16.2 month old while his head size was that of a typical 10 month old. He had some other symptoms of cerebral folate deficiency that are usually consistent with a child with DS. I've been searching for what may be the problem for the longest time! If you see these symptoms in your child, bring this information to your child's physician. There are tests that can be done to check for CFD, but the most reliable one involves a spinal tap, which is very painful and expensive. It's preferable (for me anyway) to go ahead and treat since the treatment is benign. Note: Folic acid is NOT the proper treatment. In fact, if you suspect that your child has this condition, you need to AVOID folic acid that is hiding in fortified cereals, breads, crackers, etc. Folic acid takes up the place that proper folate needs to be in. This causes a lot of problems. 2) Oral treatment with the correct kind of folate, either 5-formyltetrahydrofolate (5MTHF) or calcium folinate or a combination of both. According to the study on children with DS (see below), the therapeutic dose is 1 mg of calcium folinate per kg. When I started, Jett weighed over 10 kg, so he needed up to 10 mgs or 10,614 mcgs of folinic acid, that's 13 tablets at 800 mcg each. See my notes below for how I proceeded and my results. Note: It's important to start LOW (like 1/2 a tablet) and add another 1/2 a tablet every three days or longer until you reach the desired dose. It's not toxic because it's water soluble and your child will pee out the excess. But they may become angry, aggressive, agitated, hyper, skip naps etc. if you give too much too quickly. The symptoms won't last longer than a day, but they are unpleasant. What kind of folate is best for the typical population? And what kind of folate is best for those with the MTHFR variation? What about folate for those with DS? Mom and high school science teacher, Linley, pointed out that, in Down syndrome, studies have shown that large doses of calcium folinate produced significant improvement in young ones with DS -- and some of those in the study surely had the MTHFR variation since it's common among those with DS. So it is possible that the l-5MTHF type of folate that works so well in the typical population, especially for those with the MTHFR variation, may not work as well in the DS population since it may skip a step in the process that our kids may need to get folate to the brain. And folate for those with DS and the MTHFR variation? 1 mg of calcium folinate per 1 kg, but, since Jett has two copies of the MTHFR variation, I substitute one tablet of the l-5MTHF type of folate just to make sure he has that as well in case he needs it. So, he gets 6 tablets of the calicium folate and 1 tablet of l-5MTHF in the morning and then 5 tablets of the calicium folate and 1 tablet of l-5MTHF in the afternoon (at 800 mcg each). I came to this dose from reading the studies below. For a baby under 18 months, they capped the dose at 5 mg, regardless of weight. For those above 18 months, the dose is capped at 15 mg. After 6 months of treatment, the dosage needs to be readdressed. After 6 months, Jett is down to 3 tablets in the morning and 2 in the afternoon (at 800 mcg each), still a mix of l-5MTHF and calcium folinate. At four years old, I got Jett muscle tested and he tested negative for l-5MTHF and positive for needing calcium folinate. So now, he just takes calcium folinate. #1) folinic acid doesn't require DHFR to be converted. So it bypasses DHFR in a sense. #2) by a alternate route, folinic acid is converted into THF. This is where the bottleneck is happening with 5-MTHF, because of the low methionine synthase. so hopefully, with folinic providing THF, then that portion of the cycle can at least move forward, or some usable form of folate is being provided to the cycle. Here is another compounding factor however, that I recently encountered. It has been suggested in research that if there is mitochondrial dysfunction, particularly with Complex 1 of the electron transport chain, then there isn't even enough ATP being produced to provide energy for folate (either 5-MTHF or folinic) to even cross into/be up taken into the central nervous system. This being the case, it seems a moot point which form of folate to use until mitochondrial dysfunction is addressed. At 2.6 years old, Jett has an usually small head for his age since his body size is that of a typical 16.2 month old, but his head size is at only 10 months. He has some other symptoms of cerebral folate deficiency that are also usually consistent with a child with DS. I've been searching for a reason for quite some time. The cure is a milk free diet, which he's already been on since before a year old, and the correct dosage of calicium folinate. I was giving him calicium folinate at 400-800 mcg a day as per the CMF protocol since before a year old, and then, when I found out that he had the MTHFR variation and once I understood what that meant (my ped told me what I was doing with him at the time was fine -- which was incorrect), I started giving the l-5 methyltetrafolate at the same dose. The proper dose is 1 mg of calcium folinate per kg. And its the folinic not the meth kind of folate. So I started yesterday with 2,500 mcg to see what would happen. Huge cognitive leaps! He made up his first, original three-word sentence. (That I can recall.) I was filing my nails and he looked puzzled then said, "Mommy scratch stick," matter of factly. I have since increased the folinic to 5,000 mcg a day. He's comprehending books and TV shows better and having more specific verbal requests. Like I wrote on the magnadoodle a short "experience story": "Jett sat in the kitchen playing with a box. Jett found a soft, white, fluffy piece of cotton. Jett played with the cotton." Jett read it to himself and smiled and smiled. Then he pointed to the kitchen, went in, and came back with the piece of cotton and laid it on the magna doodle! (It was a shipment box of vitamins and the cotton from a vitamin bottle.) How many kids at his age have that strong of a reading comprehension?? AND, he learned from context clues what "cotton" was -- I didn't pick up the cotton and say "cotton." He figured out what is was by the adjectives I used when writing about it! I was giving him 400 mcg for the longest time, then I went up to 2,500 mcg divided by two doses (am and afternoon) to see if I could see a real difference. I did! I stayed there for 3 days with no ill effects. Then I went up to 5,000 mcg to see what would happen, divided into two doses. Still nothing bad for 3 days. Yesterday, I gave him 7 tablets in the am and 6 tablets in the afternoon. Each time I gave him one of the meth folate just in case. But he had no problems w/the methyl. This morning, he woke up reciting the days of the week (I don't think it was in order, though). He said them all then said, "Days of the week!" He said, "Today is Saturday!" (There's no way he could know it's Saturday... I think he was repeating a sentence he had learned and just happened to get the day right.) Most importantly, I didn't teach him this! But, yesterday morning, he read the "Monday's child fair of face..." poem and he may have seen a short video on Youtube with the days of the week song. But I didn't teach him this because I figured he's too young to understand what it is. It really freaked my husband and I out this morning!! This is the most and quickest he's learned anything. But, I've been giving him the Royal Jelly for two days as well now.... Crazy! We are going to try to do a video of him soon. Because it's pretty unbelievable. I'm thinking of recording him reading a welcome message on my blog. Because the large amount of folate may have causes Jett to skip his afternoon nap on occasion, I decreased the dose to 2,400 mcg in the morning and 1,600 mcg in the early afternoon. This dose seems to be working for him because: At almost 3 years old, Jett's head is finally in proportion to his body! Yeah! His height, weight and head size are all that of a typical 17 month old. (Okay, so I'm working on this.) This change to perfect proportion -- the first time since before I started monitoring at 12 months -- could be due to finally taking the proper folate, at the right dose. Usually he gets both kinds of folate, but sometimes he just gets one or the other at the same dose, not on purpose, but because of running out of this or that. He continues to progress. At 3 years old, he says many multi-word sentences a day, mixed in with one word "demands" and his coordination is improving with better, more confident walking, etc. Yesterday, we had to stop on our way home because he had to use the potty and when we walked into the bathroom he said, "What a mess! Toilet paper is everywhere!" I've used other therapies and added more supplements since increasing his folate. But it's just a note that he is not stalling, but continuing to progress. Be sure to get $10 off your first VitaCost vitamin order. Source Naturals MegaFolinic™ -- 800 mcg - 120 Tablets) is the calcium folinate. Metagenics FolaPro® -- 60 Tablets is the l-5MTHF type of folate. 5-methyltetrahydrofolate and folinic acid as well as niacinamide which helps with the symptoms you may get from using a lot of 5-MTHF. I did get the adverse symptoms when I first took l-5-MTHF and this product would have been nice to have then. Mercimek-Mahmutoglu S, Stockler-Ipsiroglu S. Cerebral folate deficiency and folinic acid treatment in hypomyelination with atrophy of the basal ganglia and cerebellum (H-ABC) syndrome. Tohoku Journal of Experimental Medicine. 2007;211:95-96. Available at: http://www.ncbi.nlm.nih.gov/pubmed/17202777. March 28, 2012. Narumi Y, Shiihara T, Yoshihashi H, Sakazume S, van der Knaap MS, Nishimura-Tadaki A, Matsumoto N, Fukushima Y. Hypomyelination with atrophy of the basal ganglia and cerebellum in an infant with Down syndrome. Clinical Dysmorphology. 2011;20:166-167. Available at: http://www.ncbi.nlm.nih.gov/pubmed/21471810. March 28, 2012. Title of Research: Down Syndrome Disintegrative Disorder: Possible Hashimoto’s Encephalopathy? The prevalence of autoimmune disease is much higher in Down Syndrome (DS) than in the general population. We have encountered 10 patients in the Duke DS Comprehensive Clinic who developed cognitive regression, autistic characteristics, and insomnia beginning in their early teenage years. These patients all had thyroid autoimmunity without clinical thyroid disease. Cognitive and developmental regression associated with thyroid autoimmunity has not previously been described in children with DS. We are naming this condition DS Disintegrative Disorder (DSDD), because of its similarity to Disintegrative Disorder in three to five year old typical children. Hashimoto’s Encephalopathy (HE) is an autoimmune CNS disease associated with but not caused by thyroid autoimmunity, most commonly reported in adults, but also reported to occur in some children. Cerebral folate deficiency is caused by either autoimmunity to a tissue folate receptor or by abnormalities of folic acid metabolism. In children, cerebral folate deficiency can also lead to autism, regression, and insomnia. Chromosome 21 contains many genes for folate metabolism, folate transport, and for enzymes that require folate for activity (including N6ANTI). The purpose of the study is to characterize the clinical and laboratory findings in DSDD; evaluate thoroughly all patients with DSDD for known metabolic causes of regression; to test the hypotheses that antibodies to the tissue folate receptor and to alpha enolase are present in some subjects; and to evaluate subjects for evidence of abnormal folate metabolism. The prevalence of autoimmune disease is much higher in Down syndrome (DS) than in the general population. It appears that a subset of adolescent patients in the Duke Comprehensive DS Clinic have experienced significant regression. We would like to systematically evaluate these patients by review of medical records, laboratory evaluations, neuropsychological evaluations, and speech and language testing, and then compare the patients’ data to draw conclusions about their similarities. We are going to test these patients to see if they have a problem using folate correctly, and if they do, our next step in a future study is to treat the patients with folinic acid to see if their symptoms, such as learning, social withdrawal, perseverative thoughts, or trouble sleeping improve with treatment. Describing this subset of patients in the medical literature will help other clinicians caring for people with DS identify this dual diagnosis and monitor or treat these patients appropriately. In cerebral folate deficiency syndrome, the presence of autoantibodies against the folate receptor (FR) explains decreased folate transport to the central nervous system and the clinical response to folinic acid. Autoantibody cross reactivity with milk FR from different species prompted us to test the effect of a milk-free diet. Dev Med Child Neurol. 2004 Dec;46(12):843-51. Cerebral folate deficiency. Ramaekers VT, Blau N.
Cerebral folate deficiency (CFD) can be defined as any neurological syndrome associated with low cerebrospinal fluid (CSF) 5-methyltetrahydrofolate (5MTHF), the active folate metabolite, in the presence of normal folate metabolism outside the nervous system. CFD could result from either disturbed folate transport or from increased folate turnover within the central nervous system (CNS). We report on a novel neurometabolic syndrome in 20 children, which we term 'idiopathic CFD'. Typical features became manifest from the age of 4 months, starting with marked unrest, irritability, and sleep disturbances followed by psychomotor retardation, cerebellar ataxia, spastic paraplegia, and dyskinesia; epilepsy developed in about one third of the children. Most children showed deceleration ofhead growth from the age of 4 to 6 months. Visual disturbances began to develop around the age of 3 years and progressive sensorineural hearing loss started from the age of 6 years. Neuroimaging showed atrophy of frontotemporal regions and periventricular demyelination in seven children, slowly progressive supra- and infratentorial atrophy in three children, and normal findings in the remainder. Because active folate transport to the CNS occurs through receptor-mediated folate receptor protein 1 (FR1) endocytosis, DNA sequencing of the FR1 gene was performed and found to be normal. However, CSF protein analysis revealed a non-functional FR1 protein, suspected to result from either post-translational defects of FR1 protein N-glycosylation, the presence of folate antagonists with irreversible binding, or autoantibodies blocking the folate binding site of FR1. Oral treatment with 5-formyltetrahydrofolate (folinic acid) should be started in low doses at 0.5-1mg/kg/day, but in some patients higher daily doses of folinic acid at 2-3 mg/kg/day are required to normalize CSF 5MTHF values. This proposed treatment protocol resulted in a favourable clinical response in patients identified before the age of six years while partial recovery with poorer outcome was found beyond the age of 6 years. Careful clinical and EEG monitoring should be performed 1, 3, and 6 months after the beginning of treatment. After four to six months of folinic acid treatment, CSF analysis should be repeated in order to prevent over- or under-dosage of folinic acid. Secondary forms of CFD have been recognized during chronic use of antifolate and anticonvulsant drugs and in various known conditions such as Rett syndrome, Aicardi-Goutières syndrome, 3-phosphoglycerate dehydrogenase deficiency, dihydropteridine reductase deficiency, aromatic amino acid decarboxylase deficiency, and Kearns-Sayre syndrome. The pathogenic link between these underlying specific disease entities and the observed secondary CFD has not been resolved. 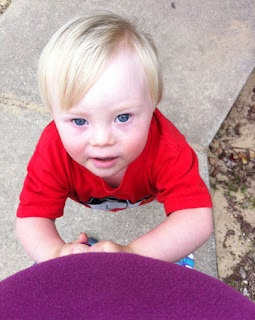 As for prenatal supplementation--there's a lot you can do and need to do as a mom carrying a baby with Down syndrome (referred to as "you" "us" or "we"). I wrote this while 6 months pregnant with my second child and acted as if the baby I carried may have DS as well, just in case. And, once I had my baby and was breastfeeding, I continued with these supplements. Which prenatal multivitamin is best? The prenatal vitamins for the typical population won't work as well for you for many reasons. There are only a few prenatals that we have to choose from. I was using this brand's non-prenatal multi as a prenatal, but they have since come out with this version. It has high-quality types of vitamins, minerals and enzymes. It does have a little bit of spirulina in it, which I'm willing to forgive since everything else is good. (Spirulina is great for typical people because it increases SOD, but not so great for those with DS who often have high SOD. See Increased superoxide dismutase and Down's syndrome for details.) It includes EGCG (green tea extract)-- which is great for our kids, research from Tufts Medical Center shows the benefits to the baby when Moms take EGCG during pregnancy (see below for details). But EGCG can interfere w/folate absorption. To combat this possibility, I take an extra amount of both kinds of good folate (calcium folinate and l-5-methyltetrahydrofolate). Bonus: it has two of the good kinds of B12! The newest prenatal on this list has naturally occurring folate, both methyltetrahydrofolate and folinic as well as the correct type of B12! (I'd also add in VeganSafe's B12 blend.) It's made without gluten, soy, yeast, wheat, casein, gelatin, sodium, dairy, eggs, shellfish, sweeteners/HFCS, artificial flavors, starch, dyes, or preservatives. Bonus of brain-boosting choline and tummy-saving ginger. It does have raw spinach, spirulina and iron, which may or may not be problematic. (I'd really try to avoid the iron.) I prefer food-based supplements vs. synthetic when possible. If this had been available to me, I would have tried this one. This multivitamin is supposedly specially formulated for us, but it contains folic acid rather than just folinic acid or folate. 45% of the typical population has the MTHFR variation so should not take folic acid and 60% of our population (moms of children with DS) has the MTHFR variation so should not take it. If you are sure that you do not have the MTHFR variation, then it would be a fine product to use. If you don't know whether you have it or not, ask your physician to be tested. For more information on MTHFR and how it relates to having a child with DS, go to the How to Prevent DS in Your Next Child in 60% of Moms post. It also has the wrong kind of B12. And a vitamin A that often causes issues in children with DS. Another issue with NTV is that it has iron; see below for why this may cause a problem. The only plus I can see is that it has a lot of choline. But all the ingredients are synthetic, another draw back. You'll need a prescription for this prenatal vitamin that has the correct folate. It's good for those with insurance since it will probably be covered. For more information, check out this article at voices.yahoo.com. However, it does contain synthetic dyes with propylene glycol and soy which are items you might want to avoid. Read the package insert with the ingredient list. ELP has the correct folate, but it has the wrong kind of vitamin C (no big deal) more importantly, it has spirulina in it which is great for the typical population, but our kids need to avoid it because of increased SOD. The amount of spirulina is small so it might not cause a problem. It also has iron... see note above. This brand has naturally occurring folate, but you would need to supplement with Folapro (l-5-methyltetrahydrofolate). It's gluten free but has raw spinach (in our kids, at least, to be avoided since it's a goitrogen and may interfere with thyroid function. See Raw Spinach and the Thyroid). I did take it for a couple of years while breastfeeding Jett. It also has iron. This product has naturally occurring folate, but you would also need to supplement with Folapro (l-5-methyltetrahydrofolate). It's gluten, diary, soy, pesticides herbicides, corn and wheat free. It does have raw spinach (which may or may not be a problem). I have taken it while breastfeeding Jett's baby brother. It also has iron. In addition to supporting overall health, our treatment goals are to address the problems particular to our situation. Learn more at mthfr.net and speak with a doctor who understands the variation. In addition to the prenatals above, extra folate is needed. The best type is the active form of folate called L-5-methyltetrahydrofolate as Metafolin. Unlike folic acid, this active form of folate requires no additional metabolic steps for the body to use it, making it a preferred choice for many moms. Folate is an essential nutrient for many body processes, including hormone metabolism, DNA synthesis, homocysteine metabolism, and nervous system function. Folate also effects heart formation in your baby. Be sure to check out these articles on how much to take and side effects. These are the best over the counter choices, but see if your doctor will prescribe Deplin (l-methylfolate) or Metanx at your next appointment so your insurance can cover it. Also look into iodine supplementation to support proper hormone function. It's common for those with a child w/DS to have thyroid issues. Click links to find out more information. DHA For DHA/EPA/fish oil, etc. I trust green pastures the most. You can look into Prime Force's Omega Rejuvenol as well. Many like Carlsons DHA. Tveden-Nyborg P, Vogt L, Schjoldager JG, Jeannet N, Hasselholt S, Paidi MD, Christen S, Lykkesfeldt J. Green Tea Polyphenols Rescue of Brain Defects Induced by Overexpression of DYRK1A). But since EGCG can interfere w/folate absorption, take an extra amount of both kinds of good folate (calcium folinate and l-5-methyltetrahydrofolate). This herb is not commonly given in relation to one of our pregnancies--I took it during my pregnancy with Jett to prevent varicose veins and only later found out about the great benefits to the brain. In the first month Jett has been taking it, we saw great results (better mood, increased sociability, increased sentence length) and I have just started taking it during this pregnancy. Jett has continued taking it since 3.5 years old. It has many therapeutic qualities including antioxidant effects, an ability to inhibit the formation of inflammatory compounds, and direct anti-inflammatory effects. Added bonus for pregnant moms: Ginger reduces the nausea and vomiting of pregnancy, even the most severe form, hyperemesis gravidum, a condition which usually requires hospitalization. There are many forms you can use. I like Gin-gins. Or there's Ginger Juice that you can add to anything from soups/broth, baked goods to Asia dishes. Pick your favorite that is okay to take while pregnant. Another great antioxidant is ubiquinol. For products I use, check out the DS Day to Day Store. Consider VeganSafe B12 (also from amazon) and folate/folinic acid.